Spring is waterfall time up Powell Lake in Coastal BC. Spring rains combined with warm weather and snow melt cause creeks and streams to flow. They result in beautiful waterfalls, especially towards the steeper cliffs and higher peaks at the head of the lake. But even down our way we get our share of water displays. This lovely falls is in the Rainbow area, about fifteen minutes north of our cabin. It's been two years since I've seen a Brown-headed Cowbird. We were on a quad ride to Fiddlehead Farm and one was foraging in the grassy meadow while we had our lunch. This week one came to visit for the first time at our cabin. It bounced around on the rocky cliff and then stopped by my garden float for a brief rest. The Brown-headed Cowbird are termed brood parasitic. They lay their eggs in another bird's nest and then abandon them for the host bird to raise as their own. Because they are a larger bird, this can be disastrous for the owner's chicks. Spring showers clear to beautiful blue skies with puffy white clouds on Powell Lake in Coastal BC. 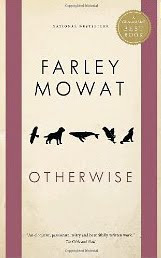 I'm a fan of Farley Mowat books. When Wayne and I first started coming to Canada on vacations in the 80's, we liked to read books that would give us a flavour of the country we would be visiting. Naturally, a few of those were written by Farley Mowat. Over the years, I've continued to collect his books and am proud to say I have about two-thirds of the forty-two he has authored, and have read more than half so far. Mowat's most recent work is Otherwise. It's a memoir covering his youth, World War II service and subsequent revival in the Barrengrounds of the Arctic north. The "others" are the animals, both domestic and wild, that have been a core part of his being over the years. They inspired and sustained him in good times and bad. If you've read several of Mowat's books, you know his life experiences have been retold in several ways. One of his earlier works, Born Naked (1993), also tells of his early life and love for animals and the north country. I'm glad that I read that book before Otherwise. The war years were hard on everyone. Farley learned to make his way through and around the bureaucracy of the military. He was very inventive in an organization that didn't reward thinking outside the box. Upon returning to Canada, Farley wanted to get back to nature and a less complicated (and constrictive) way of living. Scientific expeditions took he back to his beloved Saskatchewan and the flora and fauna he knew so well, but it wasn't enough to make him feel re-connected. The opportunity to go on an expedition to the Barrengrounds to study caribou was the perfect (for him) solution. Based in a remote cabin at Windy River, he discovered his true calling, the preservation rather than destruction of nature and the people who depend on it for their livelihood: caribou, wolves and the native peoples of the north. Many of Farley Mowat's books about the Canadian north (1981 Video: Ten Million Books), it's people and animals grew out of these early life experiences. The People of the Deer, his first book published in 1952, focused on the starving Ihalmiut people he met and lived with on this very expedition. 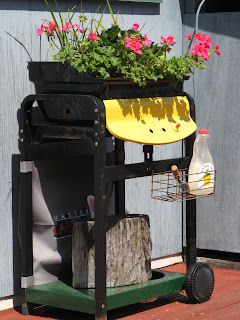 Yesterday you read about how I repurposed a BBQ to become a planter for my cabin porch. Last year I wrote about about repurposing other items in Use It, Don't Lose It. I told about how I used a plastic pancake syrup bottle as a "watering can" for my sprouting seeds. It works really well because you can really control the amount of water by how hard you squeeze. I found a great blog. It's called Wasteland Rebel by Shia and her husband Hanno. 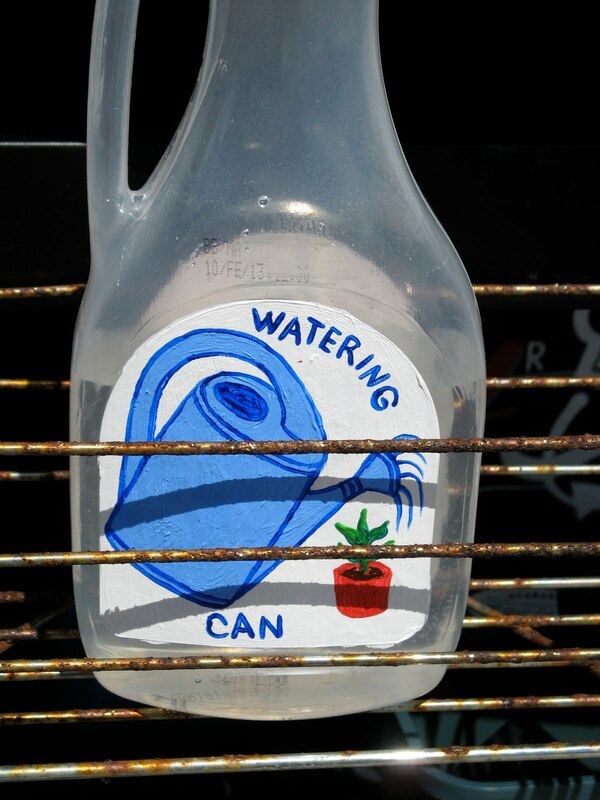 It focuses on zero waste strategies they use to reduce their trash to one mason jar per year. That's amazing, but Shia recommends to start where you are and implement the strategies that you can. One article that caught my eye was The 5 R's of Zero Waste which are refuse, reduce, reuse (repair), recycle and rot. The article talks about the importance of finding new purposes for items that are broken or worn out. I did just that with an old BBQ at the cabin. 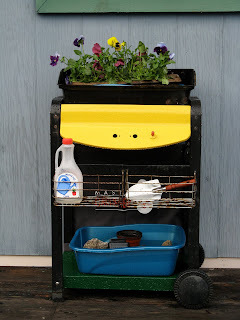 I've been wanting a potting stand and planter to put under my kitchen window. I designed one to build from wood, but when our BBQ was damaged during a winter wind storm (see Flipping Burgers), it gave me a new idea. Rather than throw it away, I decided to clean it up to be my "new" planter. To make it a look less like a BBQ, I removed the side shelf, burner, knobs and lid. The legs and sides were in pretty good shape, but the bottom self was very rusty. I used some leftover RustOleum paint we had to cover up the labels on the front panel and resurface the shelf. 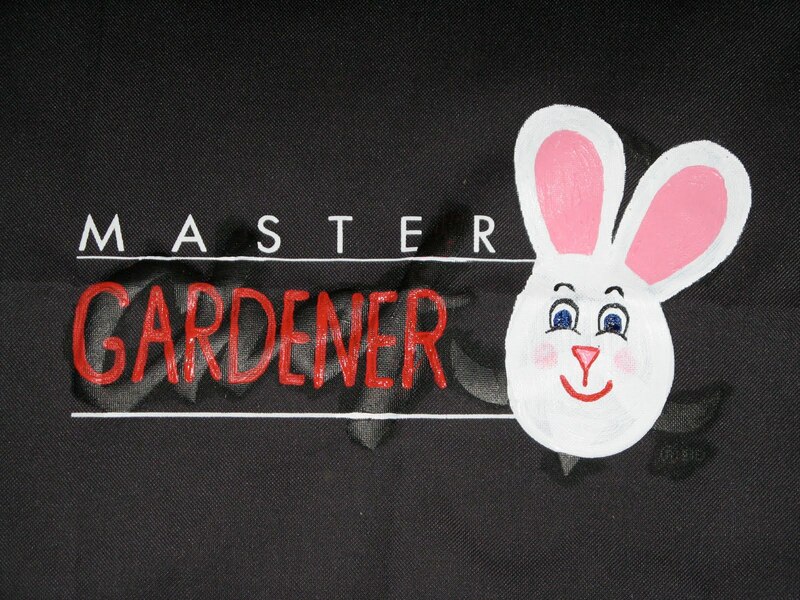 The back panel proclaiming "Master Chef" became "Master Gardener" with a garden bunny mascot. I wanted plastic trays to fit on the shelf and inside the top to hold my seedlings and plants. I found litter boxes at Canadian Tire for $4 on sale that were the perfect size. That made the total cost of my planter remodel $8. The planter looks pretty good. 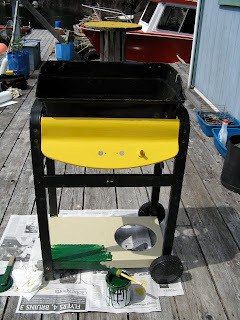 Yes, I know, it still looks a bit like a BBQ, but it makes me feel good to know I gave a new purpose to something that would have otherwise taken up space for years to come in the dump. The Powell River Forest Canoe Route draws paddling enthusiasts from around the world. It follows a chain of 8 lakes through the back country and is best navigated in a canoe or small kayak. That's because of the 5 portages between the lakes. Wayne and I own what we lovingly call the Big Yellow Banana. It's a Current Designs Libra XT that's almost 22 feet (660 cm) long and 92 pounds (41 k) soaking wet. Add our camping gear and you can barely lift her off the ground. Obviously, we aren't going to take her on the whole Canoe Route, but you can access portions of it by vehicle. Last week on a warm spring day we transported the Yellow Banana to the Nanton Lake Campground. Nanton is a beautiful Forest Service camp on the Goat Lake Main logging road. This is an active logging road, so use caution and obey signs. After launching we paddled the north side of Nanton. It's shallow near the shore and the bottom is covered with plants, perfect for trout but tough on lures. We let this little guy go home to his mama. Nanton connects with neighboring Horseshoe Lake through a wide channel. The waterway is dotted with lots of old snags from logging early in the 1990's before the dam was installed on Horseshoe. Horseshoe also has lots of floating logs and stumps. We found hundreds (maybe thousands) of them in a solid log jam blocking the opening. We decided to work our way through. At times we felt like explorers moving through ice floes in the Northwest Passage. We would nose forward and pull logs past our hull. Sometimes we were blocked by a solid mass and had to reverse course. After about an hour we made it to open water. We followed the north shore to the campground at the portage to Little Horseshoe Lake. It was late afternoon and the camping area was already in full shade. We decided to continue south to find a sunnier spot. About two thirds of the way down the lake (just above the canoe symbol on the map) we crossed to the west side and found a perfect spot on the bluff of an island. It was a rustic site with a stump bench, a mossy flat area for our tent, a fire ring that we chose not to use and a dynamite view. Our kayak floated safely below tied to several beached logs. From the healthy look of the Bearberry plants and moss on the ground, we were the first occupants of the season. After our dinner of subway sandwiches we turned in to be serenaded by frogs and loons. After a leisurely morning in camp we worked our way north fishing and trolling. About half way to the head of the lake we encountered the log jam. We paddled around it and back through the channel without any obstruction. It must move back and forth en masse with the wind. Back in Nanton, we stopped at the new picnic site built by the ATV Wednesday Trail Building Group. After a snack and rest we paddled back to our car. On the way we passed this empty Osprey nest. It looks ready to receive its new occupants for the summer season. Osprey must need and claim a large fishing territory. We only saw one other nest in Horseshoe Lake. Back at the campground we took time to unload and organize our gear for our next kayak trip. If you are planning to visit Powell River and want to camp, Nanton is an excellent choice. It has several lakeside spots, some with their own launch ramps. You can also headquarter here for ATV rides on the extensive logging road and trail network south of town. For the last three years, Barn Swallows have nested under the peak of our roof. Last week the pair returned from their long winter trip to South America. It was so nice to have them back. I had a few questions and did a web search. The author of What's in My Backyard has compiled lots of good information. I wish I knew who the author was so I could give proper credit. Life with us for the hasn't been easy. The first year their nest fell before they could even get a brood going. The next year they used the tattered edges of the old nest to build a new one and had a productive summer. Last year they returned, refurbished the nest and had two broods. All five of the chicks in the first one fell to their deaths on our porch roof. Then the nest fell at the end of the second round, but fortunately three of the chicks were ready to fly. As soon as we knew they were back, Wayne and I decided to give Mother Nature (and our swallows) a helping hand. Barn Swallows are used to building their nests of mud, grass and feathers on vertical walls, but a little ledge doesn't hurt. Wayne installed a small wooden board just below the nest site from last year to give them a building platform. I decided to try and help chicks that might fall. They say you can put one back in the nest if it survives the fall. I made a padded cushion out of an old sheet and some fiber fill. It will serve two purposes. Barn Swallow nests can be pretty messy. The little guys stick their bums over the edge to relieve themselves. It keeps the nest neat and tidy, but the surface below suffers. In addition to making a softer landing, the pad will keep our porch roof clean. At the end of the season it can go in the trash. 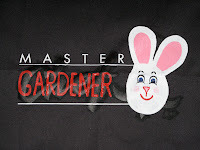 In Spring 2003 when my floating garden was new, Wayne got me a garden mascot - an Easter Bunny. Since then, Bunny has faithfully guarded my flowers and veggies, and brightened my garden in all seasons. By 2008, he lost most of his colour. The sun can be pretty harsh you know. Then, this last winter during a windy storm, he cracked into several pieces. 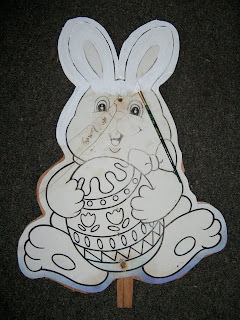 But Wayne and I didn't want to give up on Bunny. Together we brought him back to life. Wayne found a cedar shingle in our wood pile. He outlined Bunny and used his new jigsaw to cut out the pattern. 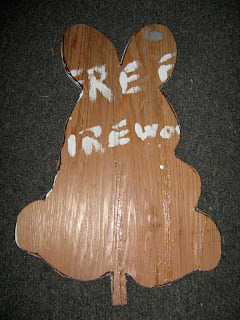 Then he used waterproof glue to piece Bunny back together on his new wood backing. You can see how cracked and faded he was. Next I used acrylic paints to give Bunny back his colourful countenance. His "backside" is plain white with a puffy cotton tail. His front used the same outlines as before and I just coloured by the numbers so to speak. 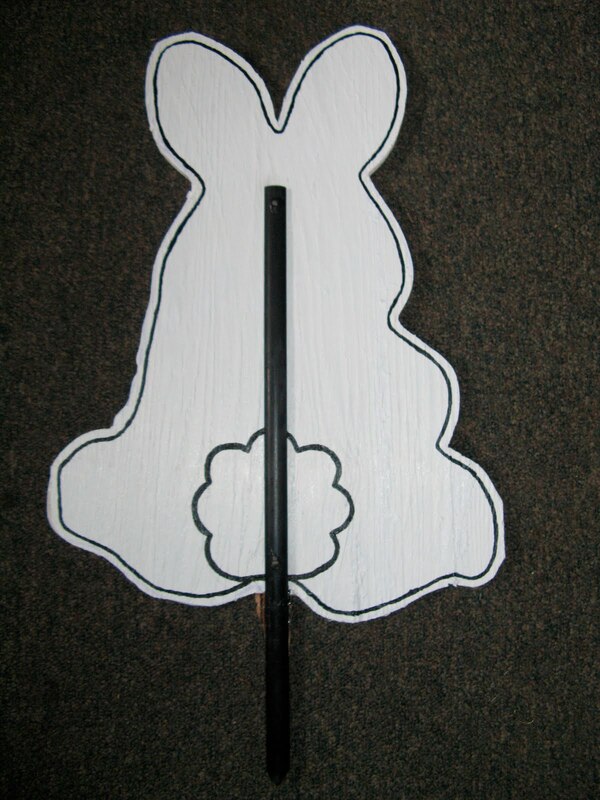 When Bunny was restored front and back, I sealed him with four coats of clear polyurethane. Since he will be standing in the garden fall, winter, spring and summer, I felt he needed a "heavy coat." That will make Bunny ready for anything the weather can dish out. We are heading up the lake today for a few days rest. I have some great stories to share when we return. 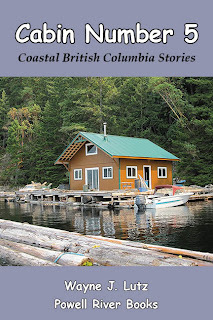 In the meantime, come to www.PowellRiverBooks.com and take a look inside these six exciting books in Wayne's Coastal BC Stories series. They're popular with locals and visitors to the Sunshine Coast because they're all about our Powell River region. Each book focuses on a different perspective. Up the Lake with stories about hiking, boating, flying and survival off the grid in a floating cabin on Powell Lake. 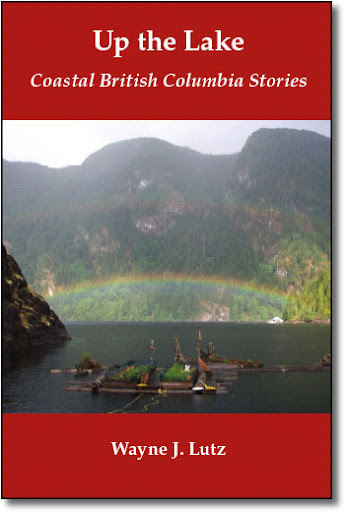 This was the first book in the series and has a variety of stories about the Powell River region. Up the Main focuses on getting into the backcountry by bike, quad and hiking. 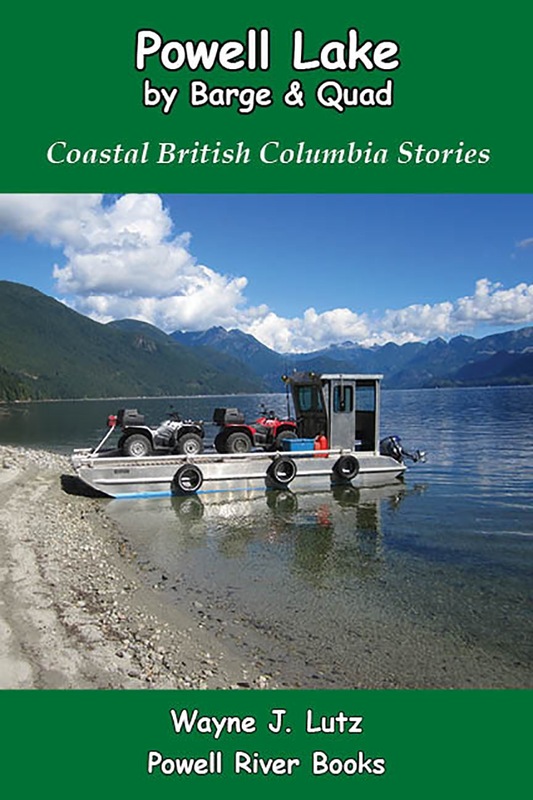 Come ride along with on a quad to places like Theodosia Inlet, the head of Powell Lake and on logging roads near and far. Up the Winter Trail takes the reader snowshoeing, hiking and biking during the winter months. This would be a good book if you are planning on coming to the 2010 Winter Olympics in Vancouver. Up the Strait cruises the Strait of Georgia to uncrowded and pristine anchorages. Follow our 24' Bayliner Halcyon Days into Desolation Sound, to unique Mittlenatch Island and the Gulf Islands. Up the Airway wings you across Canada to show off our beautiful country from up above. Fly along with us in our Piper Arrow, land to camp at remote strips with gorgeous scenery, and meet unique animals like the muskox. Farther Up the Lake is the newest book in the series. It follows in the footsteps of Wayne's most popular book, Up the Lake. 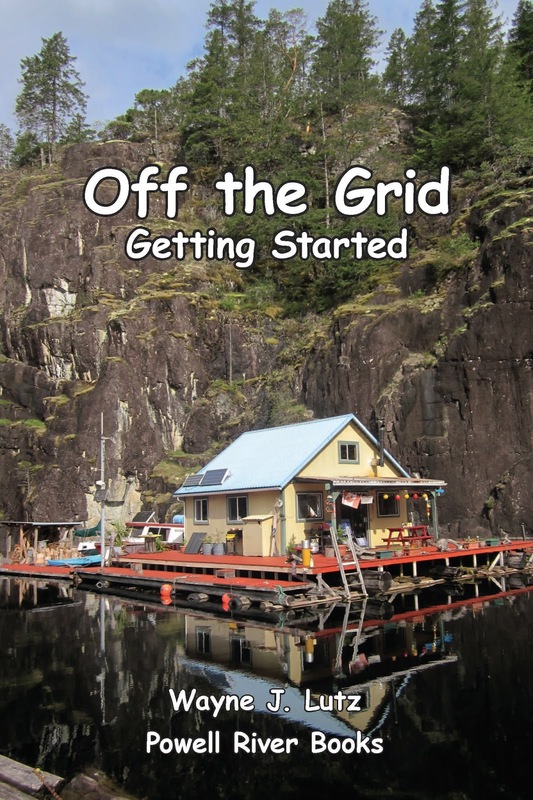 Read about living off the grid in a float cabin and about the beauties of Powell Lake. 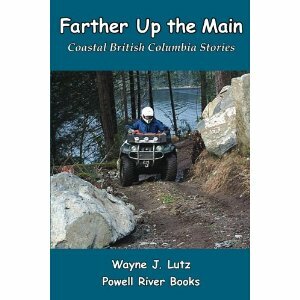 All of Wayne's books are available online through www.PowellRiverBooks.com. For Kindle format go to www.Amazon.com and for iPads and other ebook formats go to www.Smashwords.com. This week we've had some really nice spring weather. Even though it's been sunny and warm, moisture off the Pacific Ocean has generated thunderclouds over Vancouver Island and inland peaks. Last Friday just around sunset the thunderstorms started blowing off their tops and dispersing. This one made it look like someone had dropped a bomb on Vancouver Island. When we fly 997, we avoid thunderstorms. Their strong updrafts and potential hail can be very dangerous. 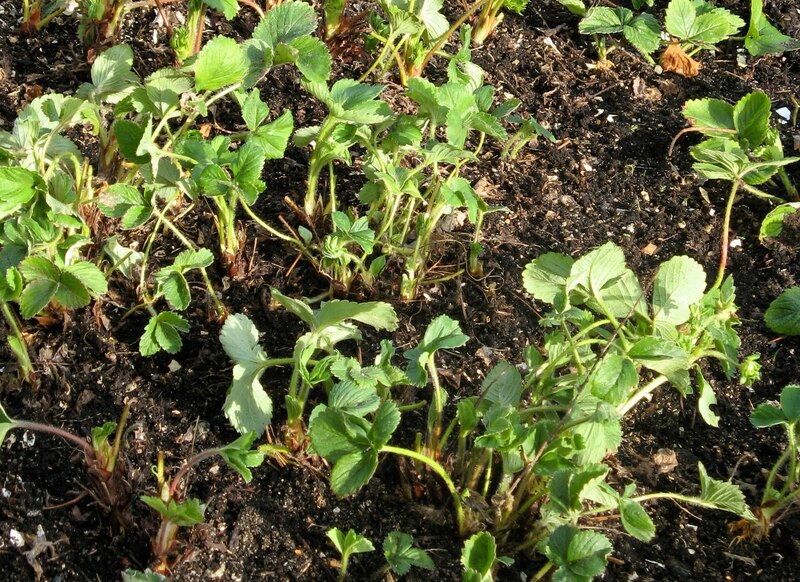 Each spring I refresh my strawberry beds to help them get ready for a bountiful summer. At the end of the season I leave the old leaves in place. As the large outer ones die and wilt, they provide a protective shield to protect the roots through the cold winter months. We do get freezing temperatures and a little bit of snow, but this bed has survived for seven years. After the danger of frost has passed, the first thing I do is remove the old leaves. If I find any slug eggs I toss them in the lake. They make better fish food than garden pests. 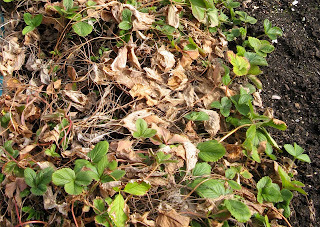 Every time I do this I think the strawberries don't have enough foliage to come back, but they do. 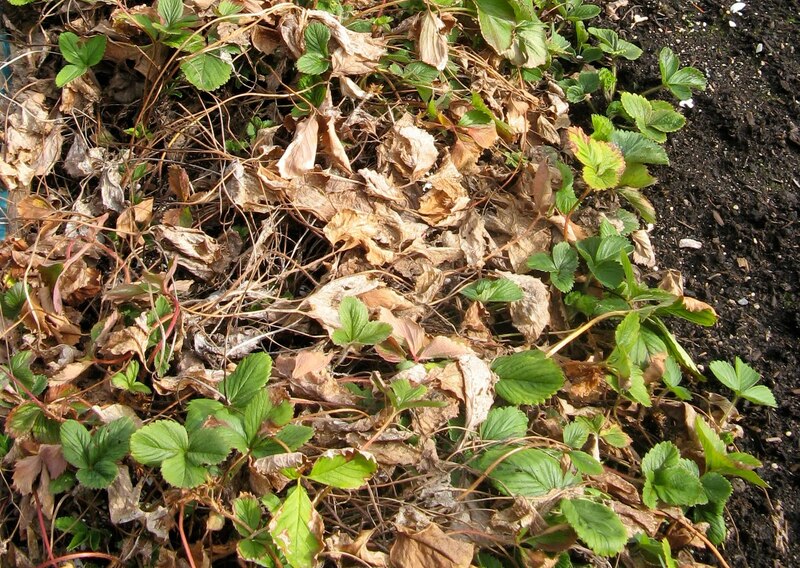 Since strawberry plants have a three-year cycle, this is the good time to replace some of the older plants with new sets. 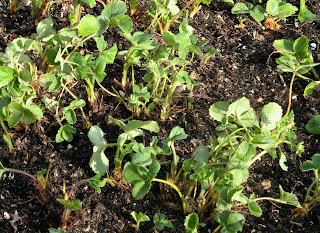 I use some runners from previous year's plants and also purchase some new sets at the nursery to keep my beds healthy. I've already mentioned slugs. I've been working on natural solutions to reduce their impact. Notice I didn't say eliminate them. I don't think that's possible. But the fewer I have, the more berries for us to enjoy. 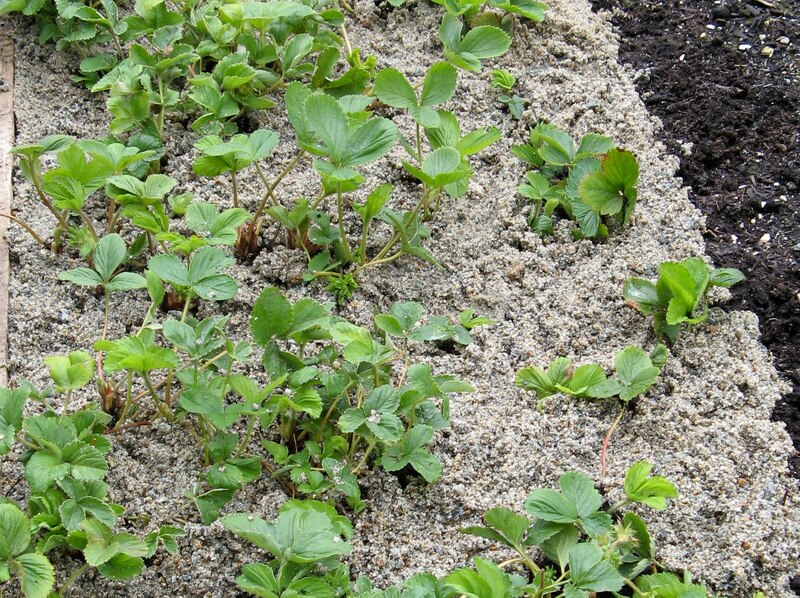 First I add a layer of clean sand underneath the plants. This way all the rain water doesn't pool on the surface, causing the fruit to rot and giving slugs a breeding ground. Plus, it acts like a mulch, holding moisture underneath during the warm summer months. 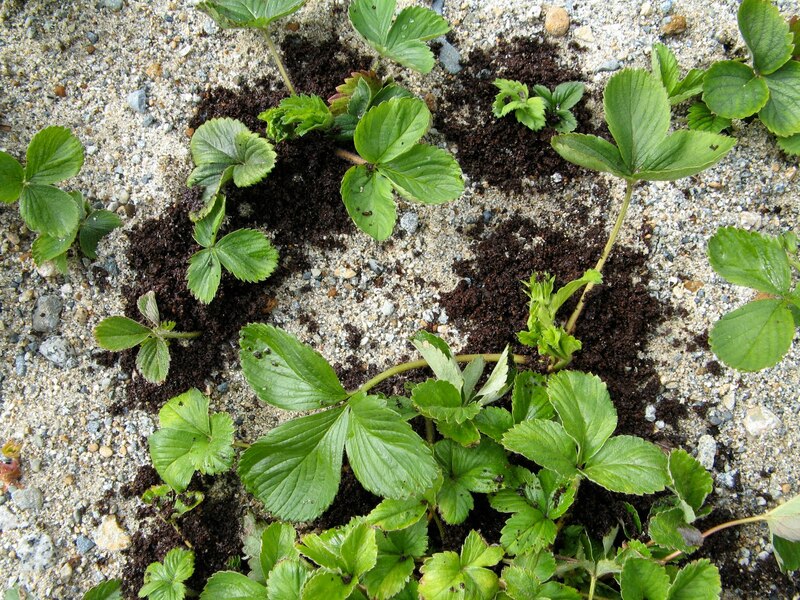 Some websites extol the virtues of using coffee grounds as an organic slug control measure. All winter long I've been saving my grounds. To prevent them from molding, I "cooked" them dry on the woodstove. 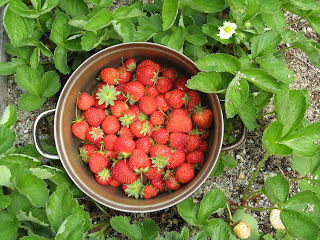 Even so, I barely had enough for my two strawberry beds. There is an added benefit from the coffee grounds. 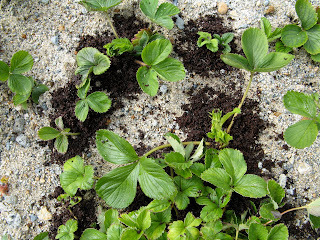 They add nitrogen to the soil, and strawberries love that. I've also saved my left over coffee to use as a spray. It may not be strong enough, but maybe there is enough caffeine to at least slow them down. As an additional slug control measure I added a layer of crushed egg shells. Again, I've saved my shells all winter long. So far, I only have enough for one of my two beds. Slugs and snails (fortunately I don't have any of those) have soft bodies. They crawl on a large "foot" and are sensitive to rough surfaces. Cuts cause them to dehydrate and then die. At least that's the theory.